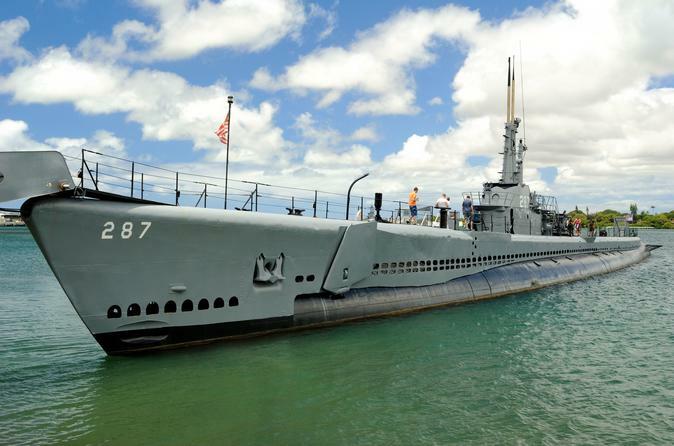 The USS Bowfin Submarine, the Submarine Memorial and the Submarine Museum are located adjacent to the Pearl Harbor visitors center. The USS Bowfin tour can be combined with any site at Pearl Harbor, and is most commonly combined with the USS Arizona memorial. The USS Bowfin Submarine, the Submarine Memorial and the Submarine Museum are located adjacent to the Pearl Harbor visitors center. The USS Bowfin tour can be combined with any site at Pearl Harbor, and is most commonly combined with the USS Arizona memorial. If you are planning to incorporate the USS Bowfin on your tour, then add an hour to your given time. Due to construction on the USS Arizona, total charge for a Arizona Memorial and USS Bowfin tour will be charge for three hours. The total length of tour will be four hours. The Submarine Memorial is located a stone throw away from the USS Bowfin. The memorial honors 52 Submarines and 3500 Officers and Crewmen lost during WWII in the Pacific. Take a moment to read one of the placards to find out what happened on their final patrol. A total of 48 submarines of the 52 were lost due to hostile fire.